Shaquille O’Neal is an retired basketball player, former rapper and current analyst on the television program Inside the NBA. He played for 6 teams throughout his 19-year career. O’Neal was first drafted into the NBA by the Orlando Magic with the first overall pick in the 1992 Draft. He won Rookie of the Year in 1992–93 and then became one of the top centers in the league, leading his team to the 1995 NBA Finals. After four years with Orlando, O’Neal signed as a free agent with the Los Angeles Lakers winning three consecutive championships in 2000, 2001, and 2002. O’Neal was traded to the Miami Heat in 2004, and his fourth NBA championship followed in 2006. he was traded to the Phoenix Suns midway through the 2007–2008 season then traded to the Cleveland Cavaliers in the 2009–10 season. He played for the Boston Celtics in the 2010–11 season before retiring. On April 2, 2013. Sports Speakers 360 is a booking agent for pro athletes. 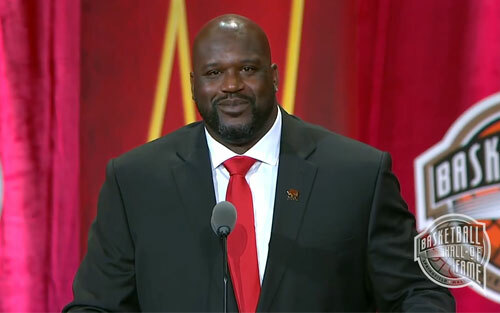 If you would like to book Shaquille O’Neal for a speaking engagement, appearance or endorsement, contact a Shaquille O’Neal booking agent for fees at 1.855.303.5450.